We aim to enable students to become confident, articulate communicators in both spoken and written English and to foster a lifelong love of literature. 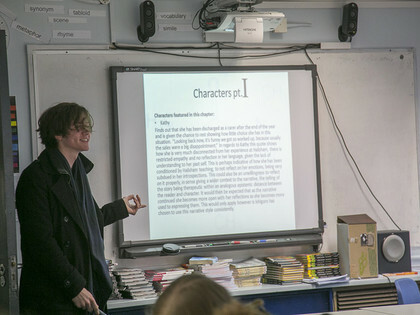 Studying English Literature at A Level allows students to develop their analytical and writing skills, to share the experiences, perspectives, ideas and beliefs of others and to express themselves in creative and original ways. A Level English is taught by Ms Lorenz, Ms Chedda, Ms Train and Ms Buchanan (currently on maternity leave). Students explore drama, poetry and prose through a combination of discussion, reading and writing; they are encouraged to broaden their independent reading and to attend lectures, conferences and theatre productions. The analytical, interpretative and discursive skills developed through studying literature provide excellent preparation for university. A level English Literature is a facilitating subject and is highly regarded by universities. e offer English Literature as a two year linear course following the Edexcel specification. Students develop and extend their reading repertoire and are expected to carry out a significant amount of independent reading and research. We believe that it is important for students to experience the richness and variety of English and drama outside the classroom. We arrange theatre visits, poetry reading events, lectures and conferences for sixth form students such as a trip to see ‘Dr Faustus’ at the Sam Wanamaker Theatre and a series of lectures on ‘Frankenstein’. We also encourage students to take on leadership responsibilities and to mentor younger students. Many students continue to study the subject at degree level at a range of universities including those in the Russell Group such as Exeter and Liverpool. Further and higher qualifications in English enable students to develop their reading, writing and analytical skills to a high level and provide a platform for careers in a wide range of areas including journalism, the law, the media, teaching, marketing and human resources. A Level students can log on to emagazine (login details available from English teachers and Sarah Garrett (Learning Resource Centre Manager).